The Counting Kingdom is a PC & Mac learning game that is available on Steam. It is designed to help teach children math in a fun and engaging way. Now now… I know what you are saying. Yes, there are many games that promise to teach your children while being fun, but this one is different. Why? Because it actually lives up to its promise. It is so enjoyable that your children won’t even realize that they are learning. When you start the experience seems very dry, but the fun ramps up quickly. Players control a young wizard who must destroy waves of invading monsters by defeating them with spell cards. Each monster has a number on it. The player must click on adjacent monsters to make their total equal one of the available spell cards that you have at your disposal. Successfully “casting” a spell removes those monsters from the board. If a player fails to do so, monsters will continue to creep turn by turn across the grid towards your castle walls. This all sounds like it would be incredibly stressful, but the monsters move one space at a time. This helps reduce the panic that sometimes set in with other games. The game itself would not be very engaging if all it entailed was adding two and two to make four. Fortunately, Little Worlds Interactive planned for this and created a system that would avoid this pitfall. 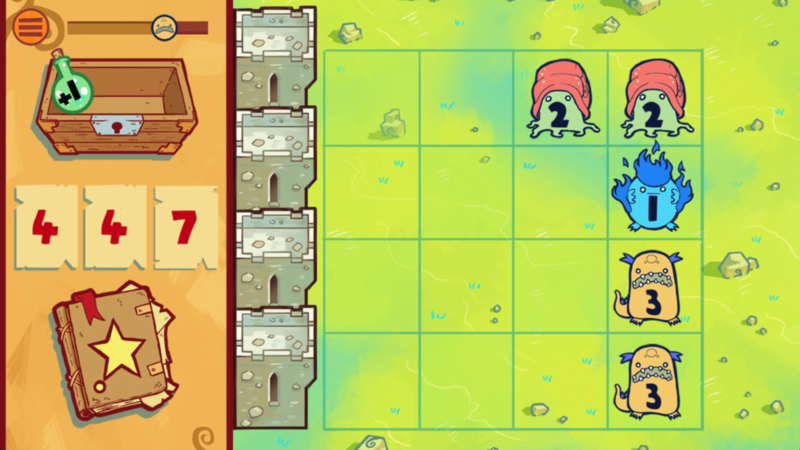 The Counting Kingdom forces players to perform multiple calculations each turn to make sure that the numbers they are reaching is able to defeat the most monsters possible. Failure to do so can leave you overwhelmed. As levels progress players are given potions that they can use to change the monsters’ numbers, freeze them, and even move them around on the grid. These are literal game changers that will help crafty players clear huge swaths of enemies OR help them dig out of a costly mistake. Everything about The Counting Kingdom is elegantly designed. Its goal is obviously to help teach math and it does that better than any program I have ever seen. It presents challenging problems without them being intimidating. Even players who aren’t terribly good at math can take comfort in knowing that they can take their time. The game even has an assist feature that will help show the work if the player makes too many mistakes. This is easily the most adorable game I have ever laid eyes on. Every single monster design is oozing with personality. If the Little Worlds Interactive were to start selling plushies of these critters I would be hard pressed not to buy them. All of them. There is nothing content wise that should give parents even the slightest pause here. The Counting Kingdom is does not require any kind of reading, but in order to succeed players will need to recognize all of their numbers and be able to do both single and double digit addition. The good news is that even if a player struggles with the math they will get plenty of opportunities to learn! Announcing Our Team-Up With Pixelkin.org!